Raising A Glass To America's Most Famous Contemporary Composer : Deceptive Cadence Hear some of the world premiere recording of Philip Glass' Ninth Symphony. 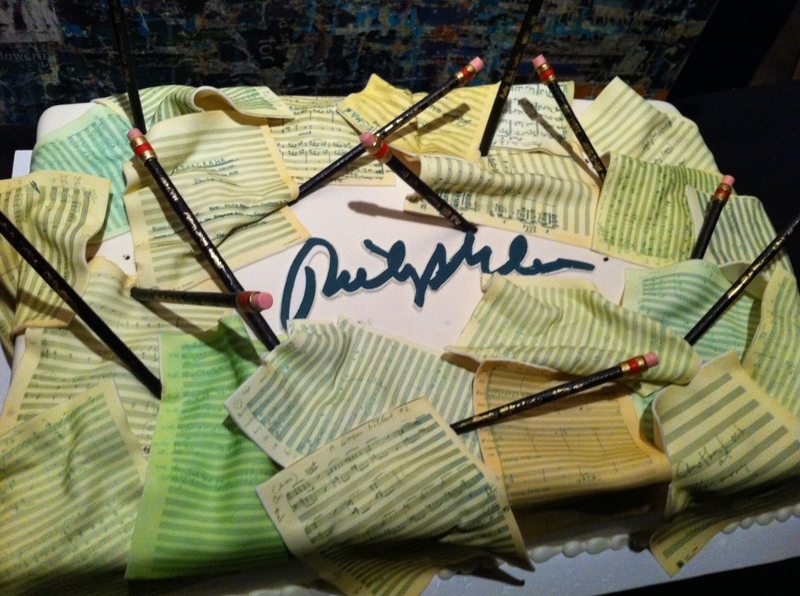 Philip Glass' 75th birthday cake — featuring some of his scores rendered in fondant. Philip Glass has earned just about all the accolades a living composer could reasonably dream of collecting. He'll be spending tonight — the evening of his 75th birthday — at the U.S. premiere of one of his recent pieces. The setting? No less august a venue than Carnegie Hall. The piece? It's his Ninth Symphony, played by the American Composers Orchestra and conductor Dennis Russell Davies. And to top off all the festivities, this piece is also being released today in its world-premiere recording by the Bruckner Orchester Linz and Russell Davies. You can hear the first movement right here. As one might expect in Glass' company and in such a setting, most of the celebration revolved around music. Some but not all was by the man himself. Pianist and Glass consigliere Michael Riesman played a piano quintet based on Glass' score to the film The Hours with members of the Signal Ensemble. Violinist Tim Fain and pianist Bruce Brubaker played a 2010 piece, Pendulum, in which Fain's brilliant performance posited Glass as an 21st-century Paganini-style showpiece composer. The Kronos Quartet played both Glass' moody arrangement of Bob Dylan's "Don't Think Twice, It's Alright" and the "China" movement of Orion, the culture-hopping piece Glass wrote for the 2004 Olympics in Athens. For "China," the quartet was joined by Wu Man, the stunning Chinese pipa player, whose confidently bent and twisted notes give Glass' score a pronounced piquancy. As Glass himself remarked later on in the evening, "All music is ethnic music," and there were plenty of other examples of how wide a variety of friends and collaborators Glass has cultivated. There were warm and delicate melodies from Gambian kora player Foday Musa Suso (another Orion collaborator), whose web address was painted in blazingly large letters on the audience-facing side of his custom-made instrument. Fiercely talented Cape Breton fiddler Ashley MacIsaac stomped out a string of Celtic tunes (the most recent of which, MacIsaac explained, was written in 1937, the year of Glass' birth). Meanwhile, bringing "ethnic" music to a more familiar American terrain were The Raybeats, the arty neo-surf band founded in the early 1980s, whose Glassfest set culminated in their cover of the 1961 Link Wray tune "Jack the Ripper." The warmth radiating from the club on this frigid January night came from Glass' own extended family as well. The composer's cousin (and our public radio sibling) Ira Glass served as the evening's genial emcee, while Glass' adult son Zack sang and played a wistful slide guitar. The evening's formal portion ended with Glass' very young two sons, Cameron and Marlowe, presenting their dad with a small cake sweetly topped off with two candles marking out "75." But there was another, much more unusual fondant-festooned cake. 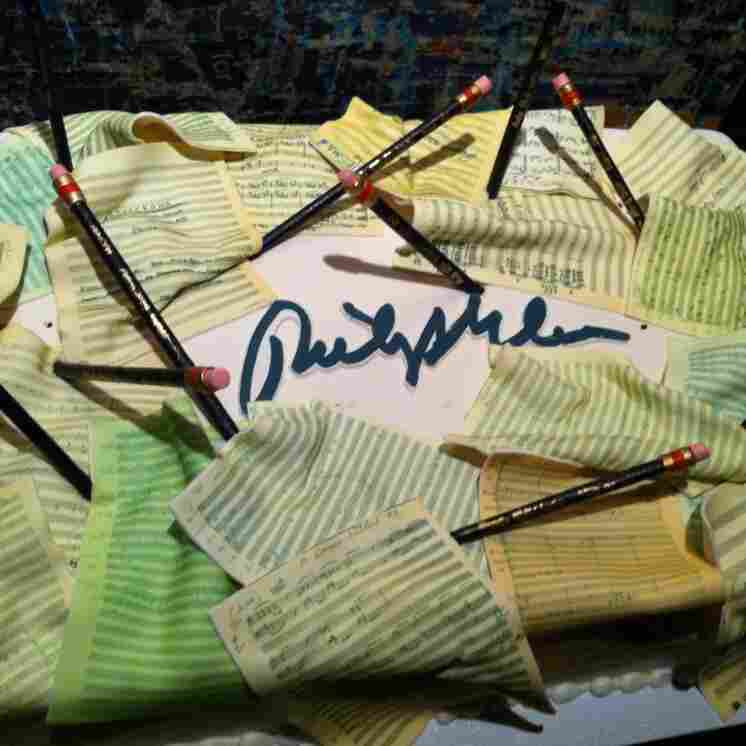 Emblazoned with Glass' own signature in the middle, it was draped with his scores rendered in frosting and studded with edible pencils. Glass peered at it in front of this gathering of friends and fans and said, "Wow. That's actually some of my music. Someone worked very hard at this." Then he plunged back into the crowd, where the wine and conversation continued to flow.